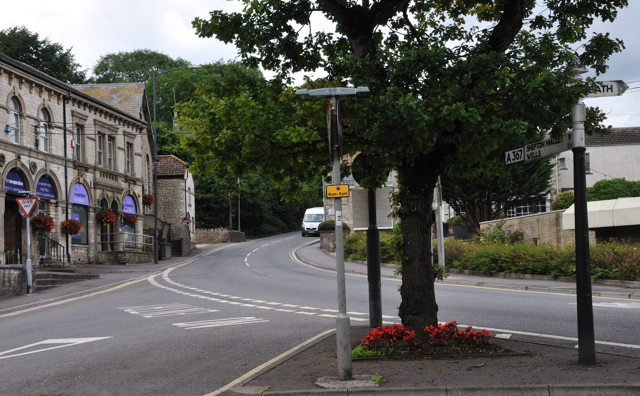 In Radstock, Somerset there is today a small road junction that most today, as they drive through, may not even notice. 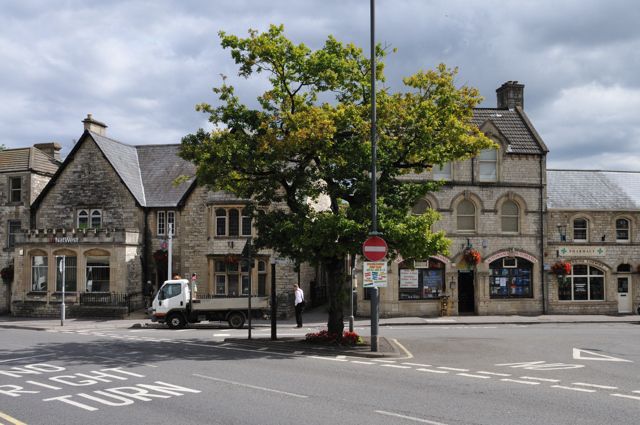 At one time however this was one of the major road junctions in this small town, within the High Street leading to the railway station, then on to Bath and Frome. Wells Hill off to Wells the nearest large place and the third direction gong to a number of local villages, with more beyond. Today a part of the one way system still makes use of this junction although most of the traffic now bypasses it. Most of the buildings are still recognisable around this junction, and even further away the shapes are largely the same, although the station has now gone and the local museum is in what was a Victorian market hall just behind it. 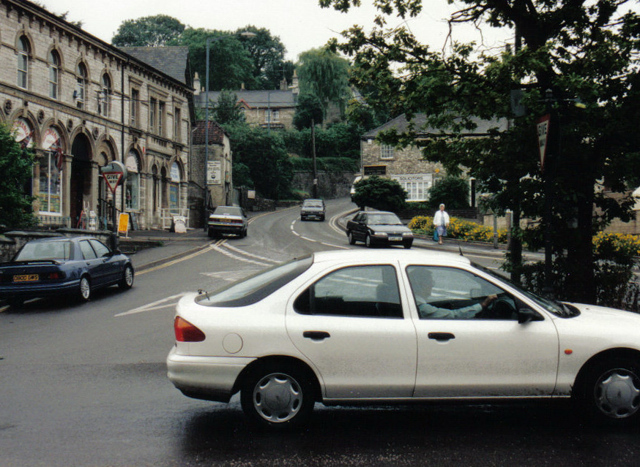 We have 4 old photographs of this junction and views from it, and as a part of a series, commissioned by a magazine, I photographed the equivalent views in 1995. 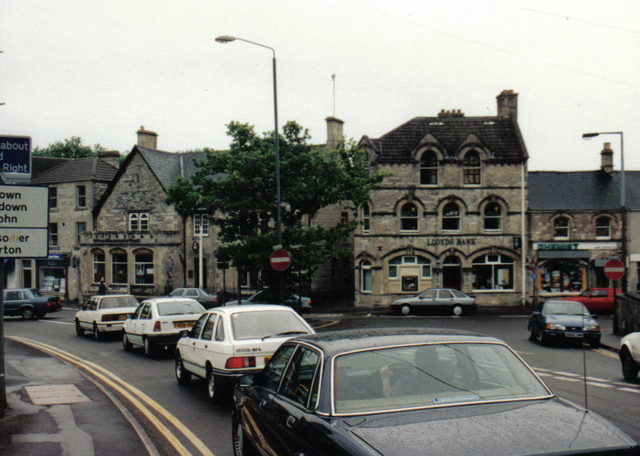 15 years now having passed, I have again photographed the junction as it is now, matching the images of the earlier time. 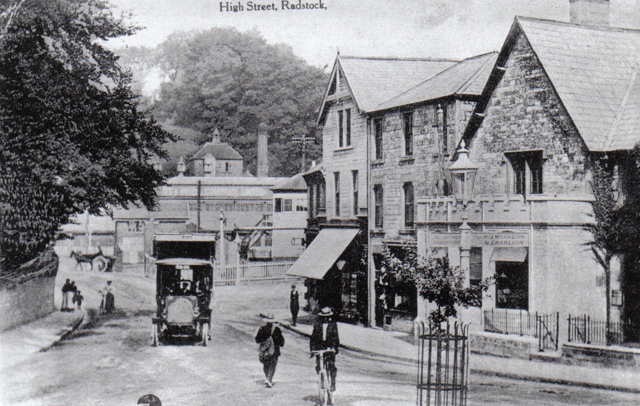 Radstock was involved in mining from very early points and by 1901 it was a major coal producing area with 79 separate collieries and was serviced by two railway companies each having their own marshalling yards, and was the end of the Somerset coal canel up to 1815, when this was turned into a tramway, the last pits were closed in 1973. We find the small tree has grown into large one, and buildings on the right have been demolished and replaced with a new supermarket. 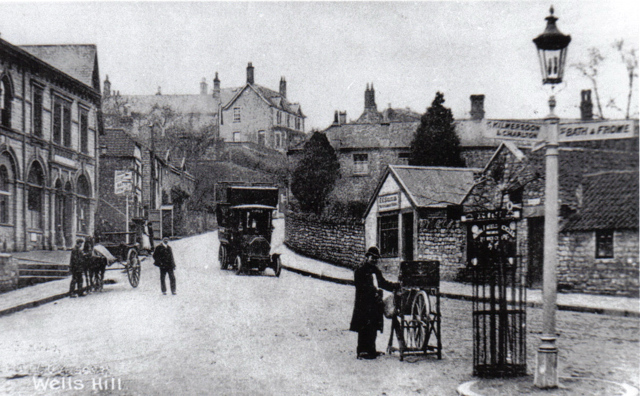 In the first photograph we see a travelling knife grinder has set up on this then quiet junction, while now its a major A road with non stop traffic, although if you wait a while there are still gaps where only a few vehicles are in view. 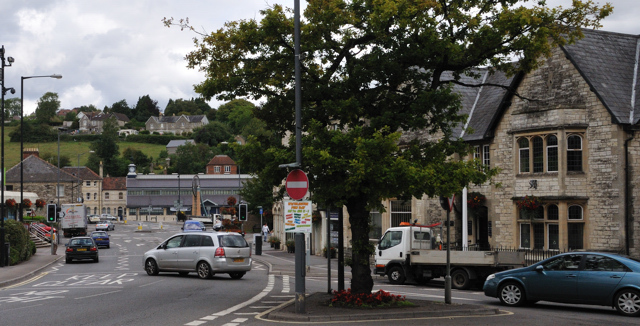 The large building we can see in the left of the picture above was the Radstock Co-op. 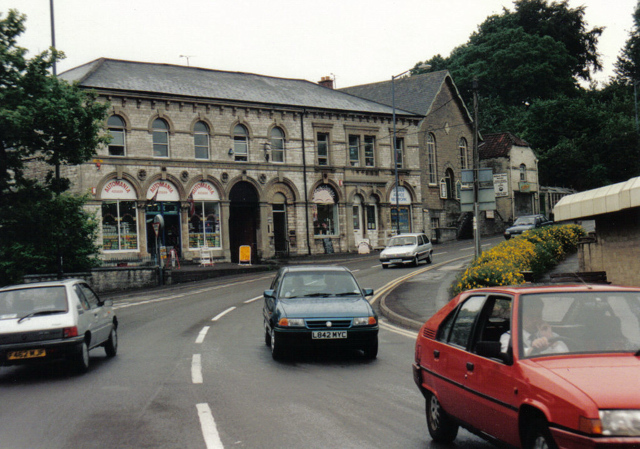 Standing in front of the old co-op building, looking down the hill to the railway station, with the same junction and signpost, now on our right we see, beyond the station is market hall. Without stopping the traffic you cannot get into the same position exactly, but from the old co-op steps and sectioning the view we can see today the view above. The road has been widened moving the centre to the left. 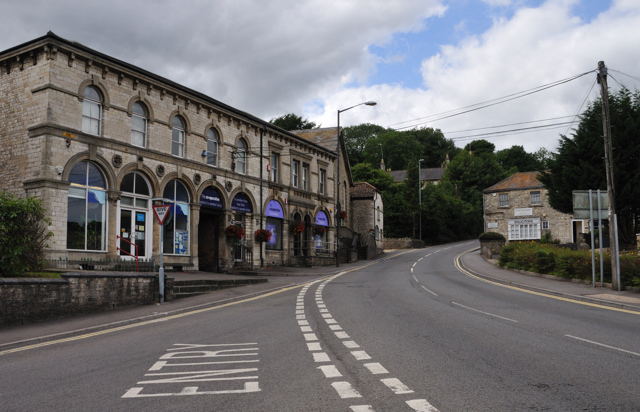 The station has now gone, but the market hall is still there, but now housing a museum. 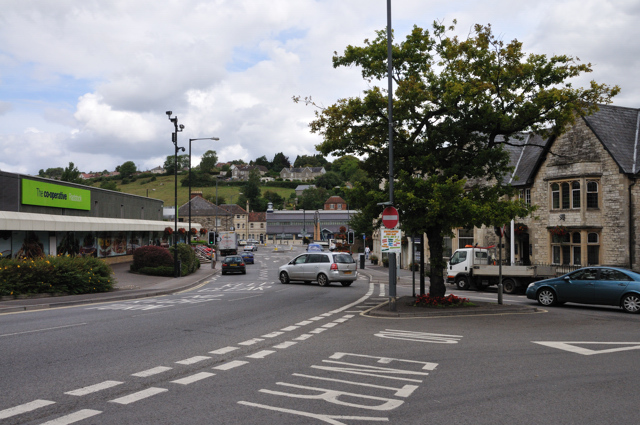 This 2010 views is the full image of the photograph above, and as you can see standing on the steps of the old Co-op we see now a new Co-op supermarket on the left. This photo I took in 1995, this time from the path on the opposite side on the road, giving a better comparative view of the buildings as they are not behind the tree. On current maps this piece of road is Wells Road as is the hill behind, the small road joining is The Street. High Street is no longer shown. 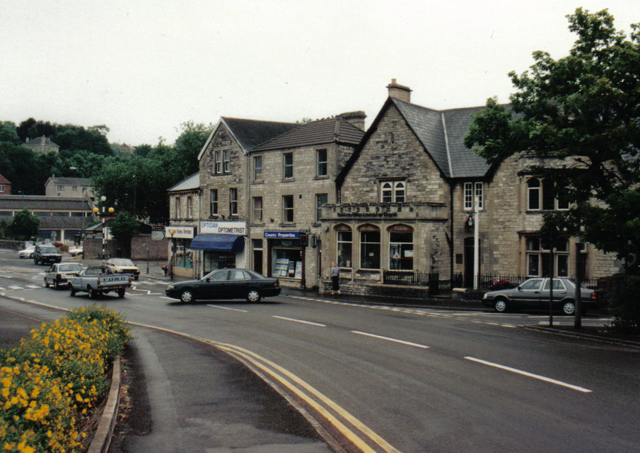 Wells Road is a part of the A367, Wells to Bath road. 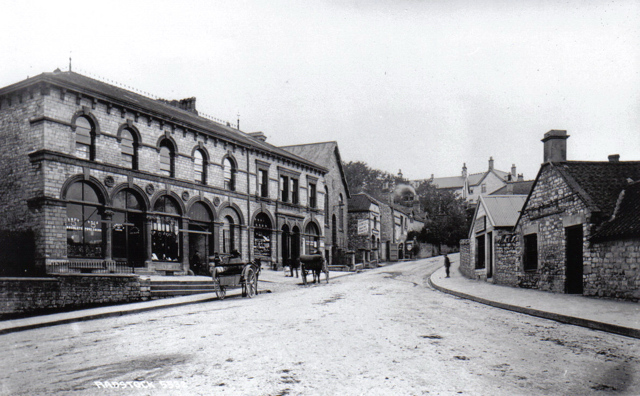 This old image shows the Wilts and Dorset Bank on the right of the central building and another bank, that I cannot make out the name of on the far left. The drug store/chemist is in the left of the central building. smaller building to the the right. The central building now sells car parts. 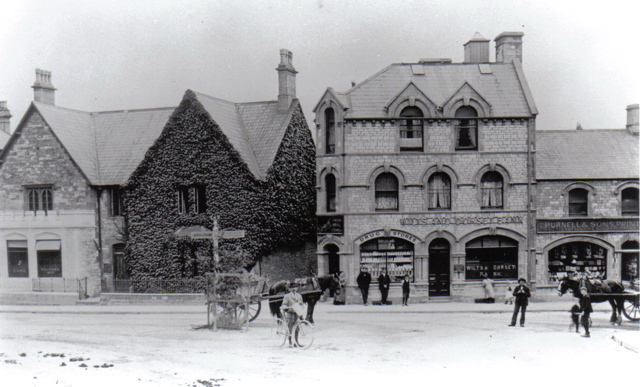 and the chemist to the right, but then the central building was fully occupied by Lloyds Bank. Getting there: On the A3567 going through Radstock, coming down the hill, from Wells heading north this is a small junction before you reach what is now a far larger junction. If you go past the junction turn left onto the A362 you can enter the Co-op car park. Please let us know any other information that we can add to the Grid(s) or page and any errors that you discover. Before making a long trip to any location it is always wise to double check the current information, websites like magazines may be correct at the time the information is written, but things change and it is of course impossible to double check all entries on a regular basis. If you have any good photographs that you feel would improve the illustration of this page then please let us have copies. In referring to this page it is helpful if you quote both the Page Ref and Topic or Section references from the Grid below. To print the planning grid select it then right click and print the selected area.